Schuster discussed the role of a global university in higher education and Webster's unique place in this landscape. 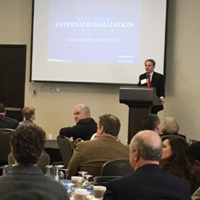 Julian Schuster, Webster University's provost, senior Vice president and chief operating officer, gave the opening keynote at the Kent State University Internationalization Symposium on April 1. The conference, held at the Kent State Conference Center in Kent, Ohio, brought together 150 academics and administrators from universities around the world as well as representatives from the government, nonprofit and corporate sectors. Schuster’s keynote, "The Global University: Its Place and Role in Higher Education," focused on the characteristics of a global university and highlighted Webster’s unique history and international footprint. Kent State University is a WINS (Webster International Network of Schools) affiliate and a strategic partner in international initiatives under Webster's strategic plan, Global Impact for the Next Century. Kent State students study abroad at Webster’s international campuses and Webster students study at Kent State’s location in Florence, Italy. A number of other collaborative initiatives are under discussion.